The brief was to provide a new public park in the Manor Royal Business District, which had been formed with the designation of Crawley as a new town. 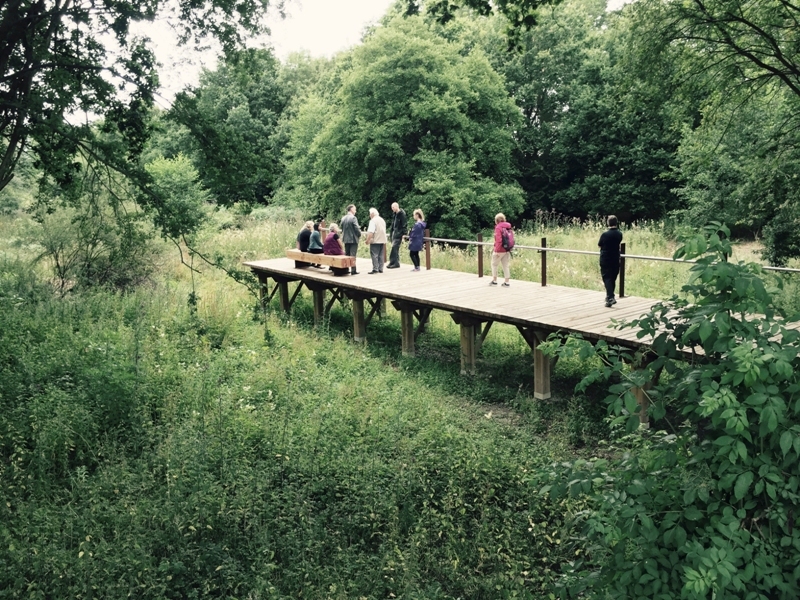 The park has acted as a catalyst for regeneration and set a precedent for other neglected pieces of land nearby. It is used for both intended and unintended activities, including geocaching, lunch-time exercise and wildlife recording days. The brief emphasised the need to find new and more co-operative ways of looking after projects once they are completed and involving local people. Innovation in the design including incorporating photovoltaic cells and a battery in signs to power uplighters and the chipping of wood that was removed to create wildlife habitats. The scheme delivers a range of environmental, social and economic benefits and is underpinned by sustainable design principles throughout, including the choice and sourcing of materials and plants. than 500 businesses and provides approximately 30,000 jobs. Although the area, with links to London and Gatwick Airport, is very well situated in the market, the quality of the built environment is generally poor. There is a huge scarcity of open space and facilities, the area is confusing to navigate, lacking landmarks and green infrastructure, and the majority of people make their journeys by car rather than cycling, walking or public transport. developments’, and as such appropriate activities can take place as long as the area remains operational and safe for users in times of flood and does not result in a loss of storage capacity or increase flood risk elsewhere. The brief was to provide a new public park that would act as a catalyst and precedent for the regeneration of other neglected pieces of land; to create a distinct landmark at one of the key entrances to the business district; and to ensure that the proposals and future upkeep are designed, delivered and managed sustainably. The brief emphasised the need to find new and more co-operative ways of looking after projects once they are completed and involving local people. The south entrance has been designed to fulfil a variety of functions. It acts both as a dynamic and static space; its distinctly directional layout is designed to entice people into and through the park, whilst also providing seating and space to linger and people-watch. It is also intended to function as a landmark at this key entrance point to Manor Royal. The scale, geometries and materials of the various elements in this area are designed to be highly legible and work together to reinforce the concept. The materials and planting are restrained, robust and appropriate to the site and context. The existing culverts, control structures, and canalised stream all, in different ways, use concrete; corten steel has an affinity with the ‘forgotten’ qualities of the space and industrial context; willow trees grow in the basin and are synonymous with water - we wanted to draw on this association; limestone to dust paths (on a cellular confinement system) are versatile and work well in both formal and informal contexts; and the douglas fir and oak seats provide much needed tactile elements to the design. The planting aesthetic can be described as a kind of stylised naturalism and plays on themes of contrast and juxtaposition. We used willow trees, which are often associated with water and natural habitats, but arranged them in a clear line, in pollarded form. The way they move in the wind, their texture and colour contrast strikingly with the built elements of the design. 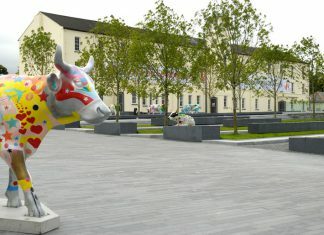 Ebrington Barracks was built in 1841 and is situated on the east bank of the River Foyle opposite the hisoric Walled City of Derry~Londonderry.